Like many people he knows on the West Side, longtime Austin resident Jonathan Tod changed his drinking habits two months ago when the county’s penny-an-ounce sweetened beverage tax took effect. “I did drink soda. 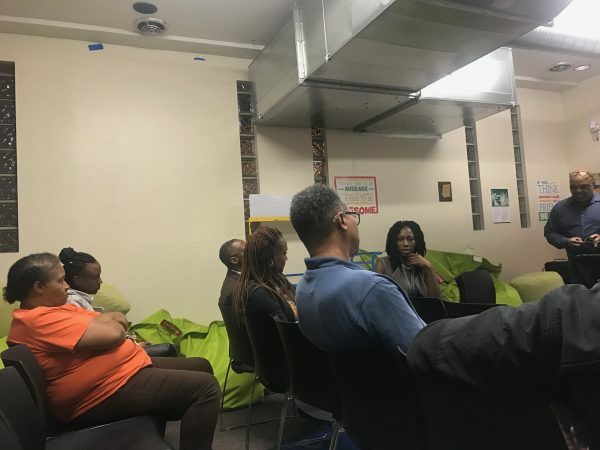 But now I’m drinking Kool-Aid,” Tod said Wednesday at a meeting held at the North Austin Branch Library, where about a dozen residents gathered to discuss their concerns about the controversial soda tax that could be repealed Tuesday. The soda tax is strongly backed by Cook County Board President Toni Preckwinkle as a way to shore up the court, jail and hospital systems, but strongly opposed by Commissioner Richard Boykin, who represents Austin. The Chicago Sun-Times reported today that Boykin and others opposed to the tax have enough votes to repeal the tax. The 2-month-old tax applies to nearly every drink other than flavored water and 100 percent juice, noted longtime Austin resident and advocate Dwayne Truss. He moderated the meeting that was co-sponsored by the Austin Chamber of Commerce and the Westside Branch of the National Association for the Advancement of Colored People. The tax hurts people in Austin, said Tod, who works as a social worker, because either they can no longer afford to buy soda or they refuse to buy it in Cook County. The tax was imposed without input from the community, and it “really needs to be repealed,” Tod said in an interview later. “It’s an attack that they continue to beat on the poor people,” he said, adding it hurts merchants as well because they’re losing business. Truss told participants Wednesday night it’s important for residents to understand the annual budget so they can make their own evaluation of whether the soda tax is the right approach to fill the county’s budget holes. The county expects to collect about $53 million from the soda pop tax by the end of 2017. That, plus the $200 million annual revenue it’s estimated to bring in over all of 2018, will be used to address some of the county’s budget challenges, including criminal justice reforms and public health expenditures, Truss said. “No one likes taxes,” Truss told the crowd. But people want services. Preckwinkle unveiled her budget proposal for 2018 Thursday, saying if the soda tax is repealed, the $5.4 million spending plan will have to be cut by 11 percent, the Chicago Tribune reported. Commissioner Boykin is pushing for vote to repeal the soda tax; that vote could happen Oct. 10. A repeal is more likely now that Cook County Commissioner John Daley has said he can no longer support the unpopular tax Thursday. Most of the participants at Wednesday’s meeting expressed opposition to the regressive tax. “They just go after what seems to be the easiest thing to tax, which typically falls on those who can least afford to pay it,” said Amara Enyia, executive director of the Austin Chamber of Commerce. In addition to hurting the poor, the tax won’t generate the expected revenue and it will not alleviate the county’s structural deficit, Enyia said. She noted that people are starting to go to Indiana or other Illinois counties to buy soda, which means less revenue for Cook County. “People change their behavior, but you do need revenue,” she said, citing examples of people carrying their groceries rather than buying plastic bags since the city of Chicago started to charge a 7-cent fee in January or traveling to neighboring states to buy cigarettes, where taxes are lower. Lifelong Austin resident Arystine Danner shares the same concern. “They need to come up with something different,” said Danner, manager of the North Austin Branch Library, in an interview. Library visitors have been affected by the new tax. The library has been offering bottled water over the past two months to those who come to meetings and book clubs; before the tax took effect they used to include soda when providing refreshment to kids and families, Danner said. The board president should not use “scare” tactics like threatening to lay off public safety workers, Tod said. He said, “We’ve got many different departments in the county that we can cut from,” rather than public law enforcement and the criminal justice system, if the soda tax is repealed. If you an individual who earned up to $30,000 last year or a family that made up to $55,000, you may be eligible to work with trained tax preparers at now cost to you. The city of Chicago in partnership with the Center for Economic Partnership and Ladder Up is providing the assistance citywide through mid-April.